Cupsy is one of those brilliant ideas that makes people say: “I should have thought of that!” This portable cup holder can be used on the couch, in bed, even in the pool. It resembles a car cup holder, but with one big difference—the material, the same high quality polypropylene that the military uses in cases to protect their equipment. It’s so tough and durable that it comes with a lifetime guarantee. Features of the Cupsy include flexible beverage containers that can fit everything from glasses to to-go cups; a special attached arm that holds stemware; and a deep center console for everything people need close by like cellphones, glasses, remotes and snacks. In fact, the Cupsy can hold a wine glass, a pint glass, a coffee cup, a brandy snifter, a cell phone, and a TV remote—all at the same time! 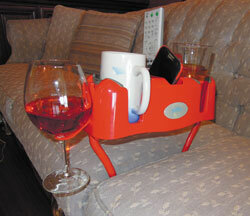 The history of this couch cup holder with detachable legs began, of course, on the couch. It was a lazy Sunday afternoon and Mark Leuker was trying to relax and watch a movie, but had nowhere to put his cup. Then the phone rang, and he could hear it buried somewhere in the couch but couldn’t find it. That A-ha moment led to Leuker, an engineer, to start thinking about ways he could combine these two needs into one couch organizer. Soon enough, he was trying out prototypes, then creating a video to show his friends—and Cupsy Nation (the Cupsy’s fan club) was born. Now all Cupsy users are invited to enter their photos and videos, join in contests, and receive special discounts. The Cupsy is available in key lime, coffee, beach sand, hot sauce, woodland camo and cobalt and typically retails for $19.99. Standard wholesale is $11.50 with volume discounts available. The minimum order is 12 units. 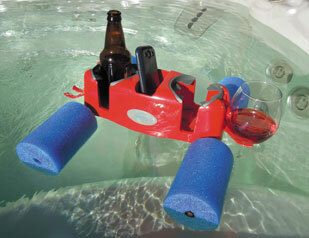 Options include floatsy legs for using the Cupsy in a lake or pool; a ground spike for taking it to the beach or park; and a special extension piece for deep couches. There is free shipping on orders over $35.